The Most Important Theatrical Trailer of 2012 Arrives! Ridley Scott's #PROMETHEUS! Where do you begin? Its been a long time coming, ever since we first heard the rumblings way back in 2009, before that the days when Ridley Scott & James Cameron shared conversations about re-booting the franchise. It got quiet, then suddenly a prequel was announced under the stewardship & direction of Scott's daughters partner & commercial director Carl Erik Rinsch. Evolution ensued, the project evolved away from the diminutive & restrictive label 'prequel', Scott stepped fully back into the foray to re-shape the legacy & once again test the vacuousness of space. Assisted by the excellent new kid on the block Jon Spaihts a new beast emerged ready for the 21st century, a new generation, a new audience awaited, more visceral & hungry. Damon Lindelof stepped in to polish & further Spaihts draft. The cast assembled, the terror reborn. Today the first full length trailer for Ridley Scott's Prometheus has arrived & its all about earth. Hit the jump to check it out. 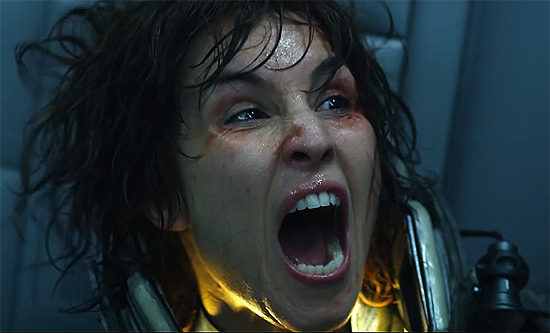 Prometheus arrives in 2D, 3D & 3D IMAX theaters this June 8th & stars Noomi Rapace, Michael Fassbender, Charlize Theron, Idris Elba, Sean Harris, Kate Dickie, Rafe Spall, Logan Marshall-Green & Guy Pearce. And yes that is a Xenomorph at 01.37. The Trailer also links to the new website ProjectPrometheus.com. I'm reading: The Most Important Theatrical Trailer of 2012 Arrives! Ridley Scott's #PROMETHEUS!Tweet this!